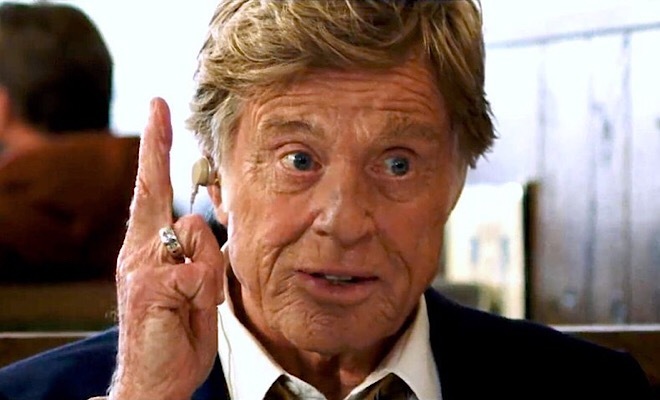 As a not-so-noble antihero who just loves sticking his sticky fingers in the proverbial cookie jar, Robert Redford gives a fine - and if you believe him, final - performance in The Old Man & the Gun. 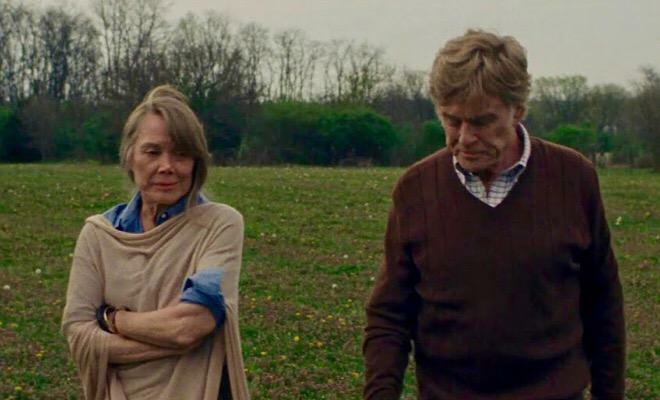 Writer-director David Lowery’s wry, wistful chronicle of an aging bank robber’s last hurrah captivates in fits and starts, but the excellent portrayals by Redford, Casey Affleck, and Sissy Spacek beautifully resonate. 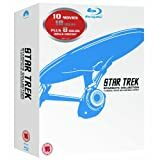 Solid video and audio transfers and a nice supplemental package distinguish Fox’s Blu-ray presentation, which is certainly worth a look. When 82-year-old Hollywood icon Robert Redford announced his retirement last August, interest in his new film, a quiet little character study called The Old Man & the Gun, skyrocketed...at least among those of us who remember the dashing actor in such definitive films as Butch Cassidy and the Sundance Kid, Downhill Racer, The Way We Were, The Sting, and All the President’s Men. Though the boost in buzz wasn’t enough to make this small movie a huge hit, the idea of Redford riding off into the cinematic sunset adds some extra grace notes and a sentimental aura to an intimate film that’s already an unabashed love letter to its enduring star. Redford’s stoic presence dominates The Old Man & the Gun, writer-director David Lowery’s wistfully nostalgic, wryly comic, and very human film loosely based on the real-life escapades of aged bank robber Forrest Tucker. A career criminal who carried a weapon but never used it, Tucker planned and executed countless heists over the course of many decades either on his own or, in his later years, as part of the Over-the-Hill Gang, a geriatric trio of outlaws who often flew under the radar due to their advanced age. Charm and civility were Tucker’s trademarks, and he took great pride in endearing himself to his victims. When he approached a teller or bank official and ordered them to fill his canvas sack with cash, he was always soft-spoken, well-mannered, and, above all, a gentleman. He was also the consummate professional, plying his trade with the utmost precision and dedication. Tucker loves his job, and so does the man who spends the bulk of the film trying to catch him. 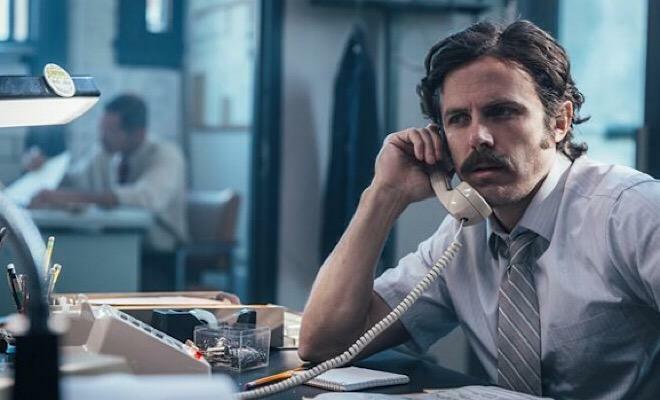 Detective John Hunt (Casey Affleck) is a hard-working police officer with a wife and two kids, and when Tucker begins a string of robberies in the summer of 1981, Hunt vows to hunt him down. Tucker, though, is a slippery subject, and he’s often one step ahead of his dogged, forthright pursuer, who begins to grudgingly respect Tucker despite his unlawful deeds. The constant allure of the next heist, however, grips Tucker like a potent narcotic, continually putting him in jeopardy. Yet in a strange, fascinating way, robbing banks nourishes his soul, and even the love of a rich widow (Sissy Spacek) who knows nothing of his secret criminal life isn’t enough to break him of his addictive habit and entice him to retire from the game. Character studies are tricky to pull off, but Lowery’s nuanced script contains just enough plot to fuel the film’s narrative engine and keep us engaged. Pacing is leisurely, several scenes meander, continuity is somewhat choppy, and a few exchanges don’t have much of a point, yet the whimsical tone that pervades the proceedings combined with a host of top-notch performances help smooth the rough patches and produce a largely enjoyable, occasionally poetic picture. At the risk of sounding unpatriotic, I’ve never considered Redford much of an actor. Icon, without question. Actor, not so much. Back in his heyday, his classic movie star looks always overshadowed his largely one-note portrayals. Redford, much like Cary Grant or David Niven before him, could coast through an array of roles just by playing himself. Off screen, though, he was far more interesting, and in an ironic twist, his earnest, admirable, and often passionate work on behalf of environmental causes and as a champion of independent filmmaking colored and enhanced his heroic on-screen persona. And as he aged, Redford‘s metamorphosis continued. He evolved into the “strong, silent type” of actor - noble and magnanimous - and his best parts, which would have pleased Teddy Roosevelt, allowed him to speak softly and carry a big stick. Forrest Tucker is one such part, and in many ways, it’s the quintessential Redford role. If it is indeed his screen swan song, it‘s a fitting farewell. Redford slips into Tucker like a pair of old shoes and underplays to perfection. His deadpan deliveries, easygoing charm, and hints of reflective melancholy fit the character like a glove, and as the movie progresses, the lines between actor and role begin to blur. Toward the end of the film, Lowery salutes Tucker’s lawless yet oddly purposeful life, but in so doing, he also celebrates Redford, using an array of photos - and a snippet from Redford’s 1966 drama The Chase - that provide a brief yet glorious overview of his career. 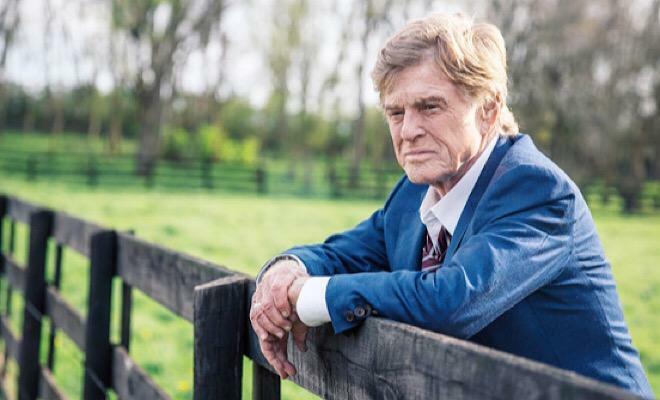 The Old Man & the Gun is an old-fashioned star vehicle for an old-fashioned movie star, and Redford anchors the film with a serene sense of confidence and the look of a man who’s seen it all, done it all, and is content at last to rest on the laurels of a life well lived. Redford, though, isn’t the whole show. Far from it. Huge amounts of credit must go to his fellow actors, whose unaffected and deeply affecting work help Redford raise his game. The rumpled Affleck beautifully juxtaposes the wearying drudgery of a demanding job with the exhilaration of the pursuit, all while believably portraying a loving yet beleaguered husband and father. Spacek (where have you been the past several years, wonderful Sissy??) contributes luminous work as the patient, indulgent, and blissfully ignorant Jewel, who’s both the jewel of Tucker’s life and the unsung jewel of this movie. Every time Spacek is on screen (which isn’t nearly often enough) she steals focus, and her comfortable chemistry with Redford lends the film essential intimacy. The picture’s best scene, however, belongs to an unbilled actress and only lasts a couple of minutes. In a marvelous, low-key cameo, Elisabeth Moss all but steals the movie. Hers is hardly a showy performance, but it radiates warmth and authenticity. It’s tough to make an impact in a single sequence, especially when the actor remains stationary throughout, yet Moss rivets attention as she conveys myriad emotions in a natural, understated manner. 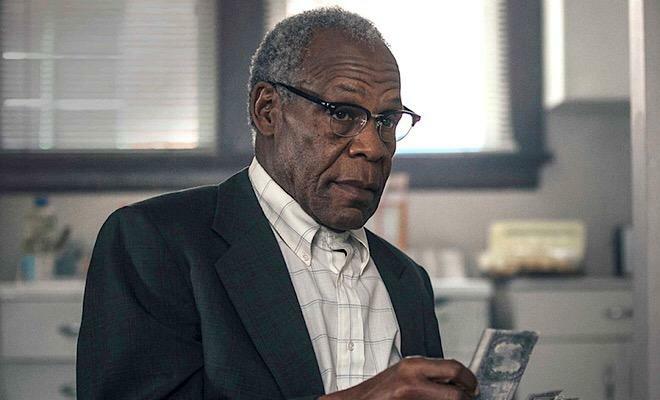 The Old Man & the Gun is a film of moments, and there are enough memorable ones sprinkled throughout to make the dual stories of Tucker and Hunt worth our time. Lowery tosses in a few too many homages to other movies and sometimes lets his characters hijack the narrative, but his heart is in the right place and the film’s amiable tone reflects that. Though, in essence, it’s little more than a trifle, The Old Man & the Gun at times feels almost mythic. That’s what a revered star at the end of a long and illustrious career can bring to a film, and Redford does just that. Just because I’m not a Redford fan, doesn’t mean I won’t miss him. I most certainly will. Much like Forrest Tucker, he’s a rare breed. The Old Man & the Gun arrives on Blu-ray packaged in a standard case inside a sleeve. A standard-def DVD and a leaflet containing the code for the Movies Anywhere digital copy of the film are tucked inside the front cover. Video codec is 1080p/AVC MPEG-4 and default audio is DTS-HD Master Audio 5.1. Once the disc is inserted into the player, previews for Can You Ever Forgive Me?, The Favourite, and Widows precede the full-motion menu with music. Director David Lowery decided to shoot The Old Man & the Gun on 16mm film stock, which lends the movie a slightly gritty, nostalgic, and semi-documentary feel that beautifully suits this leisurely character study. The 1080p/AVC MPEG-4 transfer from Fox accurately reflects Lowery’s aesthetic, but the resulting image underwhelms. Thanks to an abundance of grain, The Old Man & the Gun hardly looks like a recent theatrical release. Though clarity and contrast are quite good, the picture lacks the typical sheen of most new releases, and that might rankle some viewers. Personally, I like grain, and when you’re watching a couple of aging Hollywood icons like Redford and Spacek, the texture is more than appropriate. Colors are intentionally muted, but they’re vivid enough to often infuse the film with a lovely warmth. Black levels are rich, shadow delineation is good, flesh tones appear natural and stable throughout, and close-ups are sharp enough to highlight all the creases in Redford’s weathered face. Interestingly, the transfer’s most surprising element is its less-than-pristine source material. I can’t recall a recent release transfer that exhibited intermittent specks, marks, and a couple of blotches, but this one does, and though the instances are few and far between, they are no less disappointing. I’m amazed that a clean print of this film could not be found for its Blu-ray release. Given the movie’s highly textured look, such imperfections aren’t as glaring as they otherwise might be, but they do knock down the transfer’s overall score. The Old Man & the Gun may take place in the 1980s, but its print shouldn’t look like it came from the same era. The DTS-HD Master Audio 5.1 track is peppered with some nice surround effects that give this intimate film a more expansive feel. The rear channel bleeds are generally subtle, but palpable enough to be noticeable. Stereo separation across the front channels is also distinct, and a wide dynamic scale handles all the highs and lows of music and effects without a hint of distortion. Dialogue is well prioritized and easy to comprehend, and no surface noise muddies the mix. Though sound isn’t a major player in this production, this high-quality track adds a great deal of atmosphere to what is essentially a quiet film. A nice supplemental package enhances this Blu-ray release. Audio Commentary - Writer-director David Lowery sits down for a commentary that’s as easygoing as the film. In a relaxed, conversational style, he talks about how he tried to make the movie in an old-fashioned manner with a minimum of visual effects, acknowledges various homages to other films, explains why almost all of Keith Carradine’s footage was cut, points out personal moments and impromptu decisions, and shares a number of interesting anecdotes. He also says he sought to replicate the tone of Fantastic Mr. Fox, prefers the picture’s quiet character moments to its plot-driven sequences, and was always conscious of Redford’s legacy during shooting. Though Lowery didn’t know at the time that Redford was considering retirement, he still hoped to celebrate his image, presence, and contributions to the film industry. This track is far from essential, but fans of the movie will certainly find much to like about it. “Everything Else We Shot” (HD, 9 minutes) - This seamless compilation of deleted scenes features some nice character beats, as well as a number of scenes featuring Keith Carradine, who only appears in the final cut for about 10 seconds. “Prison Cats” (HD, 3 minutes) - If you’re a feline fan, you’ll enjoy these snippets starring a cat that slinks around the prison set. “On Filmmaking” (HD, 13 minutes) - Redford and Lowery engage in a captivating chat that encompasses a variety of topics, from the genesis and impact of the Sundance Film Festival (which was founded by Redford) to the finer points of the movie’s production. Redford analyzes his character and explains why he identified with Forrest, while Lowery discusses the chemistry between the actors, the hunted and hunter psychology that fuels the film, and how he wanted to emphasize the “fun” aspects of the story. “31 Wake-Ups” (HD, 7 minutes) - Raw behind-the-scenes footage provides an inside look at how four scenes were set up and shot. Photo Gallery (HD) - A slideshow of 24 behind-the-scenes color photos can be run either automatically or manually. 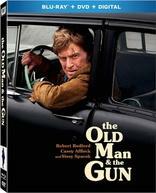 Theatrical Trailers (HD, 5 minutes) - Two very different previews of The Old Man & the Gun complete the extras package. If The Old Man & the Gun really does turn out to be Robert Redford’s swan song, he ends his distinguished screen career on a wistful, winning note. 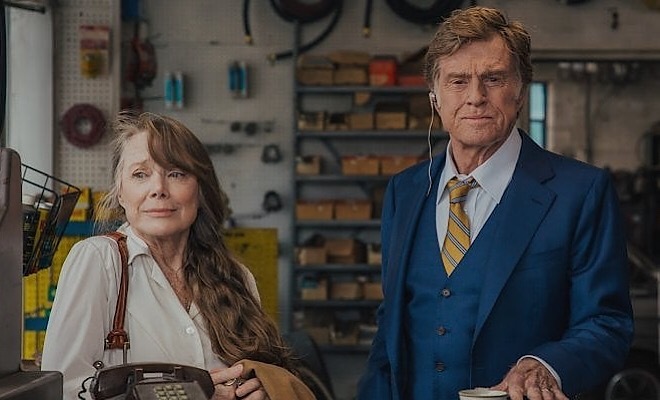 Writer-director David Lowery’s sardonic, oddly heartwarming portrait of a serial bank robber’s last hurrah is a bit uneven as a film, but the understated, natural performances of Redford, Casey Affleck, and the always luminous Sissy Spacek make the movie worth watching. Fox’s Blu-ray presentation features solid but not exceptional video and audio transfers and a nice array of supplements. If you’re looking for a cozy flick with some wry humor on a cold winter’s night, this nuanced character study just might fill the bill. Worth a Look.